What a great surprise for any occasion to receive the Basket of Delight. 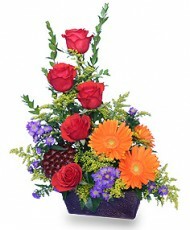 This arrangement includes the following: Gerber Daisies, Roses, Buttons and Greens. It can be customized for your someone special. the someone special in your life very happy. All orders in by 3:00 PM EST, are delivered the same day! Special Male in your life. All orders in by 3:00 PM EST, are delivered the same day! 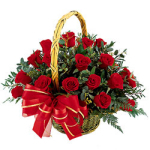 Lovely Basket of 12 or 18 or 24 red roses, assorted greens, and filler flower (baby breath or other type.